In April, LATTICE WORK was in Boulder, CO for the Communikey Festival of Electronic Music and Art (CMKY). We had been to CMKY before and lived in Colorado, so being back was a bit of a homecoming for us and felt super cozy to be building LW in such a warm and friendly environment with so many friends (new and old). Paper was generously donated from the University of Colorado at Boulder’s recycling center; an estimated 6000 sheets were used + 30 rolls of tape. 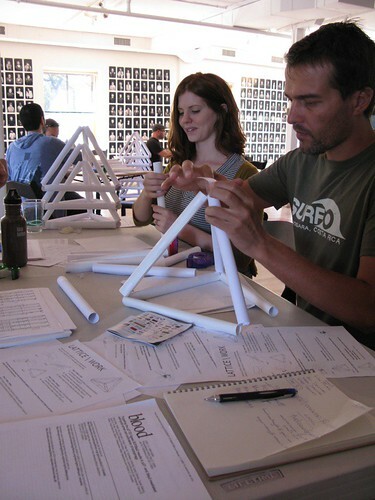 Over the span of 4 days, we saw almost 100 people making tetrahedrons! LW was located in CMKY headquarters, on the second floor of the Boulder Museum of Contemporary Art (BMoCA). In such a highly trafficked location, most everyone who attended the festival saw LW when they came through headquarters to pick up event passes, wanted to check out the merchandise table, or talk with a CMKY staffer. We even had some museum visitors sit build tetrahedrons too! 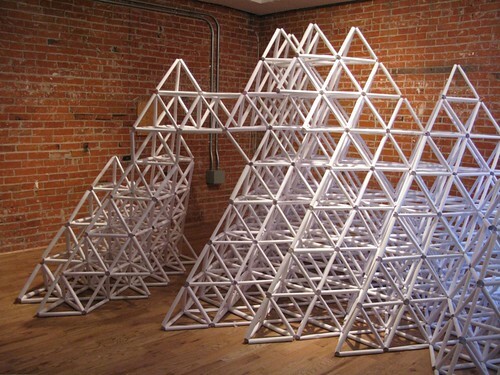 A sense of collective pride formed as people came back day after day to say hi, check on the progress and build more tetrahedrons. LATTICE WORK is such a feel good experience, bringing happiness, beauty and community to everyone whether they’re participating or enjoying the environment created. Visit LATTICE WORK on Flickr to see lots more photos from CMKY!